Now that Dawn's science mission at Vesta has officially begun, the team has begun daily image releases, with an index page located here. The images show craters upon craters, but the longer I study the images, the wackier the craters look. This photo contains a crater that seems to have dripped down the steep slope of a ridge (lower left). This photo contains craters whose walls are striped. It's interesting enough when a crater punches into material that is either brighter or darker than the surface, but many of Vesta's craters seem to display both. 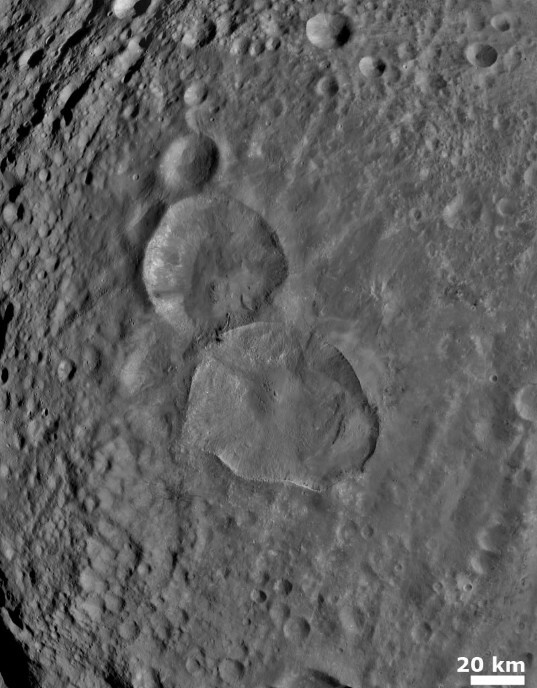 This one contains more striped craters, but also a really odd-looking one, just to the right of center near the top of the image, whose shape looks halfway between an impact crater and a cinder cone, with a very tall knife-edged rim. Then of course there's the Snowman. They released a nice detail view of this one. The two main craters are about 50 or 60 kilometers across. For a bit of context, that's more than twice the diameter of Endeavour crater, the subject of Opportunity's current roving study. They're big. Dawn took this photo of the "snowman" feature formed by three adjacent craters on August 6, 2011. The two larger craters are about 40 kilometers across. There's some interesting geology to read in this image. Particularly striking is the way that the terrain around the two big craters has been both softened and darkened. This would be the craters' ejecta blanket, the splash of rock and dust that would have rushed outward from the impact site. Here's a little cartoon of what I see -- the yellow squiggle marks the edge of that ejecta blanket. Also there's a pink star around a very small crater atop the Snowman's ejecta blanket; this crater has dark rays. Dark rays are kind of unusual, but I guess Vesta is one of the brightest asteroids in the main belt, so it's not too strange that its craters might wind up with dark rays. I can't see any way to interpret the shapes of the two craters and the ejecta blanket that surrounds them except that they formed at the same time, from a double impact. Double craters are reasonably common on Earth and Venus but less common on Mars (Bottke and Melosh, 1996), so while the idea of doublet craters is not, in principle, silly, I'm not sure how likely they are on a main-belt asteroid. I'll close this post with a bit of eye candy -- a 3D version of the Snowman, courtesy of Tayfun Öner. 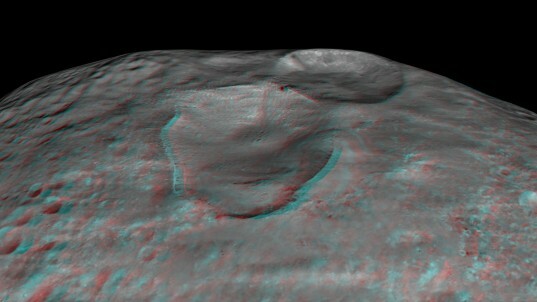 To make this 3D view of the "Snowman" crater chain on Vesta, Tayfun Öner first created a global 3D model of Vesta from the Dawn mission's rotation movie, then mapped a higher-resolution image of the snowman to it, then rendered two views of the craters from two different perspectives and combined them into a red-blue anaglyph.